Historically today is the feast of St. Conrad of Piacenza, a friar and hermit celebrated for piety and miraculous cures at Noto in Sicily and St. Gabinus, brother of Pope St. Caius, father of St. Susanna, who was ordained in his old age. St. Conrad was a Franciscan tertiary and hermit. He was a noble, born at Piacenza, Italy. While hunting, Conrad made a fire that quickly engulfed a neighboring cornfield. A poor man was arrested as an arsonist and condemned to death, but Conrad stepped forward to admit his guilt in the matter. As a result, he had to sell his possessions to pay for the damages. Conrad and his wife decided to enter the religious life. She became a Poor Clare, and he entered the Franciscan Third Order as a hermit. Conrad went to Noto, on Sicily, where he lived the next three decades at St. Martin's Hospital and in a hermitage built by a wealthy friend. During his last years, he lived and prayed in the grotto of Pizzone outside of Noto. His cult was approved by Pope Paul III. 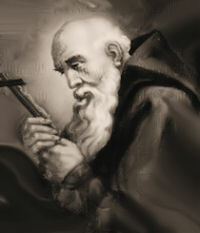 St. Gabinus was the father of St. Susanna. In the Spring of 293 AD, Diocletian announced the engagement of Maxentius Galerius to Susanna. Susanna refused the marriage proposal. Her father Gabinus and her uncle Caius supported this decision and encouraged her to keep her commitment to Christ. Her non-Christian uncles, Claudius and Maximus tried to persuade Susanna to marry Maxentius, after all this would make her Empress one day. In a conversation between the four brothers, Claudius and Maximus were converted to Christianity. The General Maxentius then came to the house, believing he could persuade Susanna to marry him. Susanna’s refusal soon led to the suspicion that she and other members of her family might be Christians. The Roman Consul Macedonius then called Susanna to Roman Forum and asked her to prove her loyalty to the state by performing an act of worship before the God Jupiter. She refused, confirming the fact that both she and other members of her family might well be Christian, There was no attempt to arrest her however, as she was a member of the Emperor’s family. Susanna refused the marriage proposal, not only because she was a Christian but in addition, she had taken a vow of virginity. When Diocletian on the eastern frontier learned of his cousin’s refusal and the reasons why, he was deeply angered, and ordered her execution. A cohort of soldiers arrived at the house and beheaded her. Her father Gabinus was arrested and starved to death in prison. Maximus and Claudius, together with Claudius’s wife Prepedigna and their children, Alexander and Cuzia are all martyred. Ironically the only survivor was Pope Caius, who had escaped and hid in the catacombs. These murders within Diocletian’s own family would foreshadow the last great persecution against the Christian church which the Emperor began in 303 AD. Diocletian’s daughter Valeria was divorced, and in June 293 AD married Maxentius who would succeed Diocletian in 305 AD. In the year 330 AD, a basilica was built over the site of the house of Susanna. It was first named San Caius in honor of the pope who had lived here. The bodies of Susanna and Gabinus were brought back from the catacombs and buried in the church. St. Barbatus was born in the territory of Benevento in Italy, toward the end of the pontificate of St. Gregory the Great, in the beginning of the seventh century. His parents gave him a Christian education, and Barbatus in his youth laid the foundation of that eminent sanctity which recommends him to our veneration. The innocence, simplicity, and purity of his manners, and his extraordinary progress in all virtues, qualified him for the service of the altar, to which he was assumed by taking Holy Orders as soon as the canons of the Church would allow it. He was immediately employed by his bishop in preaching, for which he had an extraordinary talent, and, after some time, made curate of St. Basil's in Morcona, a town near Benevento. His parishioners were steeled in their irregularities, and they treated him as a disturber of their peace, and persecuted him with the utmost violence. Finding their malice conquered by his patience and humility, and his character shining still more bright, they had recourse to slanders, in which their virulence and success were such that he was obliged to withdraw his charitable endeavors among them. Barbatus returned to Benevento, where he was received with joy. When St. Barbatus entered upon his ministry in that city, the Christians themselves retained many idolatrous superstitions, which even their duke, Prince Romuald, authorized by his example, though son of Grimoald, King of the Lombards, who had edified all Italy by his conversion. They expressed a religious veneration for a golden viper, and prostrated themselves before it; they also paid superstitious honor to a tree, on which they hung the skin of a wild beast; and those ceremonies were closed by public games, in which the skin served for a mark at which bowmen shot arrows over their shoulders. St. Barbatus preached zealously against these abuses, and at length he roused the attention of the people by foretelling the distress of their city, and the calamities which it was to suffer from the army of the Emperor Constans, who, landing soon after in Italy, laid siege to Benevento. Ildebrand, Bishop of Benevento, dying during the siege, after the public tranquillity was restored St. Barbatus was consecrated bishop on the 10th of March, 663. Barbatus, being invested with the episcopal character, pursued and completed the good work which he had so happily begun, and destroyed every trace of superstition in the whole state. In the year 680 he assisted in a council held by Pope Agatho at Rome, and the year following in the Sixth General Council held at Constantinople against the Monothelites. He did not long survive this great assembly, for he died on the 29th of February, 682, being about seventy years old, almost nineteen of which he had spent in the episcopal chair. Read more about St. Barbatus at EWTN.